Honda is back in full production both in Britain and in Thailand, following the Japanese Tsunami in March 2011 and the Thal floods in October 2011 that crippled its parts supply logistics. Honda's manufacturing operation in Swindon is back to full production after what the Japanese company's European chief described as a "very difficult year" in 2011. 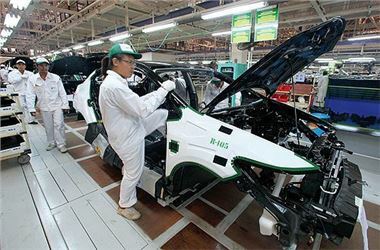 Sales and assembly were badly hit first by the devastating earthquake and tsunami in Japan, then the floods which closed Honda's assembly operations in Thailand in October. These had knock-on effects around the globe. Last year's disasters saw Honda's global production drop from 3.6m vehicles to 2.9m and sales fell from 3.5m to 3m. Even its motorcycle division felt the effects with sales falling 9% - although the company still leads with 16m sales. Keir said that Swindon lost 50% of its planned production last year as supplies of parts from Japan and Thailand dried up. "This also had a significant effect on our tier two and three suppliers who have also had a very difficult time." The UK plant builds Jazz, Civic hatchback and CR-V. Sales in Europe were down 20% last year and Keir admitted that not all of the problems were caused by the natural disasters. The company left itself short of new product. There are now plans to launch new models every year over the next four years. This has started with the new Civic and the exciting NSX sports car will arrive in three years. Keir also said that there are plans to increase research and development in Europe - including Swindon where Honda has also invested some £1.5bn. "Europe is seen as the bastion of style and quality," he said. "Honda wants its future models to have a more European feel, not just in looks and ride but in soft engineering terms such as touch, feel and smell." The Swindon plant is currently assembling 250,000 Civic and CR-V models annually and will soon add production of the company's new 1.6-litre diesel engine. By increasing shifts, vehicle production can be increased to 280,000 a year. Honda vowed to stay put in Thailand as the country is an important production base to push forward its target of one million car sales annually in Asia in five years, reports The Bangkok Post. This plant builds RHD Brio, Jazz, City, Civic 4-door, Accord and CR-V.
Hiroshi Kobayashi, president and chief executive of Asian Honda Motor, said the company aims to double its passenger car sales in Southeast Asia, India, East Asia and Oceania from 500,000 units. "Thailand is the most important market in Asia and one of our most important assembly plants worldwide. Honda is in Thailand and our commitment will never waver," he said. Honda expects this year's sales in Thailand to reach 200,000 units, with 70,000 for export. Honda's recent plan to build a new US$337 million (10.37 billion baht) factory in Indonesia sparked concerns that it would remove production from Thailand following severe floods that hit its assembly plant in Ayutthaya last year. Honda already builds the Jazz based Freed mini 7 seater in Indonesia. But the company has confirmed that the Indonesian project has nothing to do with its Thai operation. The company yesterday held a ceremony to officially resume operations at the Ayutthaya plant after it was closed on Oct 8 last year due to the floods. Prime Minister Yingluck Shinawatra presided over the ceremony. Mr Kobayashi said the government has come up with many efforts and preventive measures to deal with the issue of flooding. "I believe the government is doing well. We are also finding more diverse suppliers for sourcing," said Mr Kobayashi, who is also president of Honda Automobile (Thailand) Co. Asked how concerned he was about future floods, Mr Kobayashi shook his head. "I don't know. I just pray for it [not to happen again]," he said. Pitak Pruittisarikorn, executive vice-president of Honda Automobile (Thailand), said Honda was able to resume production within only three months. Mr Pitak conceded that the company would be affected by the government's 300 baht minimum wage policy, which becomes effective today, but said it would adopt cost management to deal with the impact. "Car price increases will be the last resort," he said. Honda is also establishing a Honda Thailand Fund, or Honda Khiang Khang Thai fund (Honda-Thailand side by side), to support worthy causes. Under the project, the company will contribute 1,000 baht for every Honda car, 100 baht for every motorcycle and 10 baht for every engine product to the fund. The fund is expected to generate 300 million baht in the first year and will have a target of one billion baht.